In a medium stockpot, mix and cook all the “Fruit” ingredients over medium heat until soft, about 20 minutes. 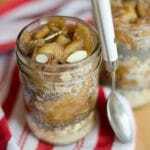 Measure out all ingredients then layer into a glass jar or bowl a scoop of the oats and chia seeds, a dash of milk, a spoonful of fruit, and a sprinkle of almond. Repeat until you’ve used everything. Store in fridge 6 to 8 hours (overnight). Recipe from Live Eat Learn at https://www.liveeatlearn.com/the-basics-of-overnight-oats/.